Twitteristas and Facebook folks just don't understand Google+ people. I'm here to help. TechCrunch co-editor Alexia Tsotsis, whom I respect and know to be earnest about her social media pronouncements, tweeted this week that "Google+ isn't dying anytime soon because it already died." Tsotsis is the perfect representative for the legions of Twitter users who dismiss Google+ as a non-event because she's a well-known, educated and popular (116,000 Twitter followers) content creator and influencer. Google+'s bad reputation is based entirely on such pronouncements by such influencers. The conventional wisdom about non-activity on Google+ among Facebook users is pretty similar. And yet Google+ fans will tell you that it's buzzing with activity, with many saying that they feel overwhelmed by the quantity of posts, comments and engagement. I think I know why Twitter and Facebook fans don't get Google+. Google's current head of social networking, Dave Besbris, really nailed what people misunderstand about Google+ when he said this in an interview this week: "People underestimate the connection Google+ has with its users around interests." He went on: "The social networking space is really dominated by audience as much as features. I'm really happy with the audience that we have. They're very passionate, they love Google+ to death. [They see] Google+ as a social network for their interests." So if Google+ is a social network for people to share their interests, what are Twitter and Facebook? In general, Twitter is dominated by news, celebrities, pundits, professionals and narcissists. Facebook is mostly about family and friends. And narcissists. And each social network draws people who are seeking the type of engagement a particular network specializes in. That's why Twitter and Facebook people don't get Google+. They've tried it. The Twitter people come to Google+ looking for Twitter type engagement, but they don't find it. Likewise, the Facebook people come looking for Facebook-like engagement (family and friends) and don't find it. It's like a Chinese tourist going to France looking for Chinese food and concluding that the food in France is terrible. Or a Hawaiian surfer bringing her surfboard to New York City and, finding no waves, concluding that there's nothing to do in Manhattan. It's true: Google+ is not the best place to get the type of celebrity and pundit engagement you'd find on Twitter, or the updates from family and friends that you get on Facebook. 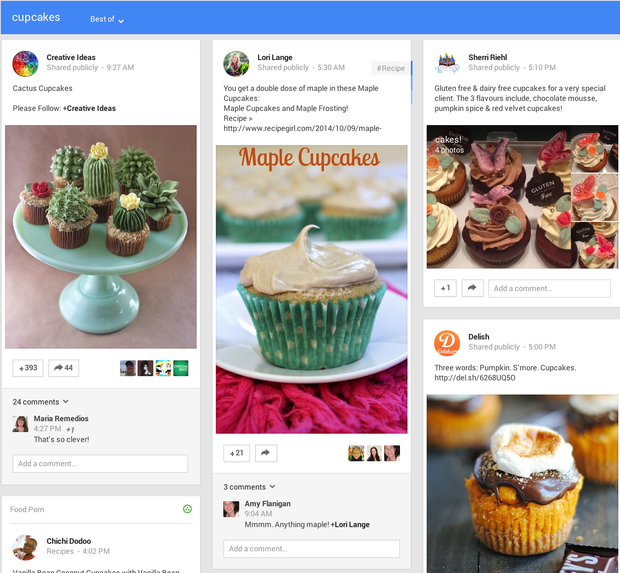 Yes, for some Google+ users, including the columnist, cupcakes are a serious "thing." Now before you criticize me for linking to a bunch of search results, let me point out another aspect of Google+ that people don't understand: Every stream is a search result. Google+ is basically a social search engine that you can add things to directly. So a search stream based on passions is a primary and completely legitimate way to use Google+. This is the activity around interests that Besbris was accurately describing. For anyone interested in anything, there's no better place to explore and connect around that interest than Google+. There is also activity on Google+ that is really quite mind-blowing, but it's way outside the Twitter and Facebook wheelhouses. Here are a couple of examples. There's a photographer on Google+ named Patrick Smith. Patrick's passion is landscape photography (scroll back to the top of this page to see an example). And his pictures are crowd-pleasers, showing dramatic scenes with the colors punched up in Photoshop, or whatever. Judge him if you will, but his posts have been viewed 50 billion times. I'll repeat that: Fifty. Billion. Times. Hundreds or thousands of other photographers on Google+ also get crazy views. So let's talk about engagement. The maximum number of comments on Google+ is 500 per post. There are 20 users on Google+ who average 500 comments per post. That means every post maxes out on comments. Every post. All of them are Asian (Indian, Japanese or Chinese) female social media celebrities or pop stars. The top engagement-getter on Google+ is Namita Pawaskar, who averages 1,698 re-shares and nearly 10,000 plus-ones (the Google+ equivalent of a Facebook "Like") per post. None of this makes any sense from a Twitter or Facebook perspective. But from a Google+ mindset, it makes perfect sense. Google+ is radically international. In fact, nearly three-quarters of the Google+ user base is non-American. And it's passion-based. Of course, it's fine to say people you've never heard of don't matter, even if they're mega superstars on Google+. And it's fine to say that you have no interests, or that you don't want to interact with people all over the world who share the interests you do have. But it's not accurate to say Google+ is dead. It's the opposite of dead. It's thriving, vibrant, active place. It's just not Twitter. And it's not Facebook. The reason I like Google+ so much is that I'm very passionate about my interests, and I want to base my social networking around that passion. I also like the provably superior level of the conversations, the obviously superior anti-troll features and the fact that Google+ has zero advertising -- but does have the best photo tools and video Hangouts. Those are all icing on the cake. As for Alexia Tsotsis? I love following her on Twitter. But she's wrong about Google+. She came to Google+ looking for Twitter and didn't find it. That is all.